It's the anniversary of the massive discovery. If this modern story of ancient discoveries is new to you, you’ve got to ask a very important question. Why does any of this matter today? There are many reasons. Yet for readers coming to the scrolls via Christian scripture, I think two items rise to the top of the list. If you keep a close eye on the footnotes of your Bible, you’ll see a number of places where the words of modern translations are different than those read by your parents or grandparents. One of the reasons for this is that we know more about ancient scribal culture and have access to hoards more biblical manuscripts today than we ever have. This means the textual foundation under the hood of most any contemporary translation is better than it has ever been. Whether you’re a fan of the NIV, NRSV, ESV, or ABC-123, each new edition involves incremental change to the actual words on the page. But this sword cuts in both directions. 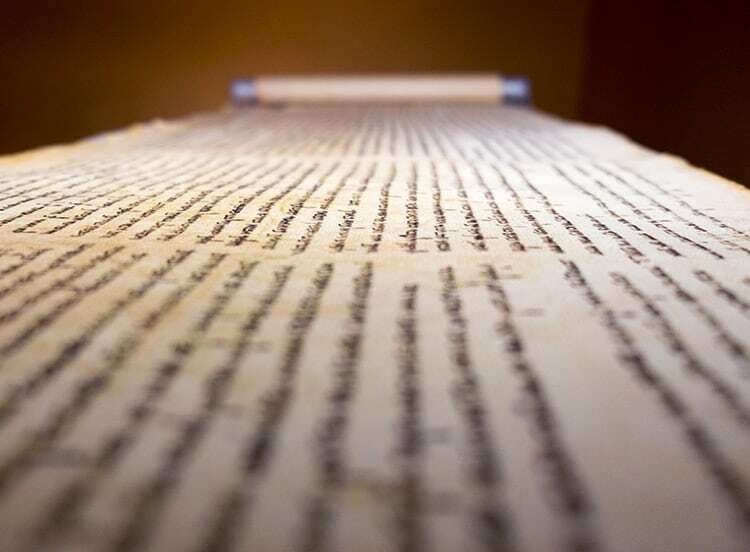 While we have far more evidence to work with, if the Scrolls taught us anything about Old Testament scripture, it is generally true that the older the manuscripts the more varied they become. Simply put: human scribes were not photocopiers and no two manuscripts are the same. Scribes copied texts but also interpreted them. That was their job. It wasn’t trickery or introducing error at every turn. This often resulted in slow growth of biblical texts with manuscripts having relatively modest variations in content. A word here, a phrase there, and in some cases, more than one edition of a book circulated. To many modern readers, this might sound like a major problem. I’d rather see it as an opportunity. An opportunity for artful restoration of a text that is both ancient and sacred. Let me show you what I mean. Have you ever been reading the Old Testament and then, wham!, some guy shows up in the story and starts gouging out people’s eyeballs? I have, very alarming. (Gotta love the Old Testament though, so old school!) Of course, I’m talking about the incident that plays out in 1 Samuel 10-11, just after Saul became Israel’s first king. In most ancient manuscripts and modern Bible translations, chapter 10 ends with a statement of a small group uttering lack of confidence in Saul’s ability to defeat the Ammonites (1 Sam 10:27). Chapter 11 then opens with the sudden introduction of an Ammonite king named Nahash, who insists on only making a treating with the Israelites so long as he can gouge out each and all’s right eyeball (1 Sam 11:1-2). Not only is this a bad deal, its super confusing in the context of the narrative. Why? Something is missing. What we have here is essentially a cut scene seemingly lost in the generations of copying all other biblical manuscripts. From this content, we learn who this Nahash figure is and why he had the sadistic penchant for collecting eyeballs. Incidentally, the ancient Jewish historian Josephus also seems to have been aware or this detail as he hints at it in his own retelling of Saul’s life (Antiquities 6.5.1). This is the single largest difference discovered when the biblical Dead Sea Scrolls were compared with all previously known witness to the Old Testament. The spectrum of other variations revealed by the scrolls ranges from the spelling of terms, to added/omitted words, or even sentences. While many common Bible translations have dabbled in the Dead Sea Scrolls and included new readings, to date the NRSV is the only one bold enough to integrate the reading described here in 1 Samuel. The challenge for many contemporary readers of scripture is contending with such new information while considering theologies we’ve inherited about what the Bible is or what we think it should be. Yet if we approach scripture as an artefact from the past that inspires today, like any piece of art worth pondering, studying, and discussing, a piece of this vintage requires artistic restoration. At times, this means an update that is new to us yet is in fact very old. The Dead Sea Scrolls give the gift of being able to see scripture as it was. So that’s a sample of the Scrolls’ contribution to the Old Testament, but what do they do for the New? The Dead Sea Scrolls predate the Jesus and writers of the New Testament. Having said that, they’re of immeasurable relevance for understanding Christian origins. It seems ridiculous to even need to remind ourselves of this, but Jesus, his disciples, Paul, and most of the cast of characters that cluttered around them in the first century CE were Jews. Taken together, the Old and New Testaments constitute Christian Scripture, yet we do ourselves a disservice when we miss that the cultural and cognitive world of the New Testament is thoroughly Jewish. While the gospel is eventually taken far abroad in the growth of the church, its home turf is in Judaea. Historically and theologically the message of scripture needs to make sense in this world. Otherwise, we’re simply putting the message of the New Testament in an abstract world entirely apart from its initial setting. That’s a bad reading strategy and tends towards missing the point. There are a number of ancient Jewish sources that help contextualize New Testament scripture, like our friend Josephus we met above. Yet the scrolls offered up an incredible new opportunity to recover some background by letting us listen in to how other ancient Jewish readers of Hebrew Scripture in the centuries leading up to the time of Jesus were thinking about theology, culture, history, religious practice, and human identity. Take for example the parallel episodes in the Gospels in Matt 11:2-6 and Luke 7:18-23. Here John the Baptist is on death row and sends two of his disciples to inquire about the exact identity of Jesus. (For the sake of ease we’ll follow the story line in Matthew, though many of these observations also work with Luke’s version). When John’s disciples track down Jesus, they ask him a very telling question: “Are you the one who is to come, or are we to wait for another?” (Matt 11:3, NRSV). In other words, “we have some ideas of what a messiah will look like, you seem to fit the bill, but can you tell exactly how we’ll know if you’re the guy?” As Jesus was known to do, he rarely gave simple “yes” or “no” answers. Here the response is challenging and thought provoking if we really hear what he is saying. In Matt 11:4-6, Jesus replies: “Go and tell John what you hear and see: the blind receive their sight, the lame walk, the lepers are cleansed, the deaf hear, the dead are raised, and the poor have good news brought to them. And blessed is anyone who takes no offense at me” (NRSV). Whether you recognized it or not, this answer is a collection of recycled and repackaged citations of the Hebrew Scriptures, mostly from Isaiah and perhaps a few hints to the Psalms (cf. Isa 35:5-6; 61:1-2; Ps. 146:7–8). However, when we flip to those passages, what we find is that the most remarkable and significant item in the messiah’s job description—the mention of resurrection—is peculiarly absent. You may have noticed, resurrection is kind of a big deal for the gospel. So where is that idea coming from? “For the hea]vens and the earth shall listen to His Messiah … for He (i.e., God) will honor the pious upon the th[ro]ne of His eternal kingdom, setting prisoners free, opening the eyes of the blind, raising up those who are bo[wed down (Ps. 146:7–8) … For He shall heal the critically wounded, He shall revive the dead, He shall send good news to the afflicted (Isa 61:1), He shall sati[sfy the poo]r, He shall guide the uprooted, He shall make the hungry rich, and [ … ] disc[erning ones …] and all of them as the ho[ly ones …]” (4Q521 2+4 ii:1, 7-8, 12-14). Sound familiar? I bet I could preach that this Sunday from the pulpit and nobody would guess it didn’t come from the Gospels. What this text shows us is that the characterization of the messianic age presented in Matthew is both anchored in key passages of Hebrew Scripture and draws on a larger complex of messianic theologies of ancient Judaism to account for the most impactful item: the hope for resurrection. Do a little Old Testament homework and you’ll find that the idea of resurrection is actually pretty latent in Israelite thought (cf. Isa 26:19; Ezek 37:1-14; Dan 12:2-3). In view of that disconnect, texts like Aramaic Apocalypse help modern Christian readers appreciate that this aspect of Jesus’ identity and message were not cut out of whole cloth. He was speaking in the terms and theology of the day. Jesus’ rundown of the resume of the messiah is his way of giving a nod of hope to John the Baptist while he’s on death-row. In effect, “Yes, I am the messiah, and you’ll see that so long as you’re up on your Hebrew Scriptures and know a thing or two about ancient Jewish messianic expectation.” Watch, learn, and be hopeful. So Jesus’ message here is not entirely new, and that’s okay. In fact, much of what he said is new to us but only because we don’t have a grasp on the conceptual worlds of the Old Testament and ancient Judaism. The Dead Sea Scrolls help clue us into parts of the conversation were missing and challenge us to encounter ancient texts as we consider their contemporary relevance. , is Assistant Professor of Religious Studies and Director of the Dead Sea Scrolls Institute at Trinity Western University near Vancouver, Canada. He is a past columnist for Bible Study Magazine, writes academic articles on ancient Judaism and the Bible, and is the author of the award-winning book The Dynamics of Dream-Vision Revelation in the Aramaic Dead Sea Scrolls. You can follow his work on Twitter (@perrin_ab) and events of the Dead Sea Scrolls Institute on Twitter (@twudssi), Facebook (/twudssi), and YouTube (/twudeadseascrollsinstitute).